6 x 10 Rockwell Copper Floor Register Discounts Apply ! This copper floor register is a craftsman style design with a plated finish. These closable air vents feature an adjustable steel damper to control air flow. Copper floor registers can also be modified to fit into the wall. Closable air vents offer one step drop-in style installation. Copper floor registers are a quality product that have a very unique look. Closable air vents are a great way to conserve energy by closing off rooms that are not in use. ***Hint: The industry standard is to order copper floor registers using the actual floor register hole size and not the outer faceplate size. This copper floor register can also be used on your walls. Use Spring Clips to attach to wall. 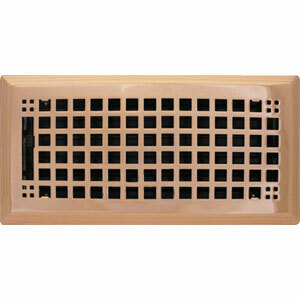 Closable air vents are available in multiple sizes and multiple finishes. Copper floor register with closable air vents are an ideal way to regulate air flow and save on heating costs, order today!